The 3rd Richmond International Cashspiel will take place November 3 - 7 at the Richmond BC curling club. It's an eight team event and so far Team Canada and Team Korea have registered, as have Team Alberta and a host team. Several other teams have expressed interest and the organisers, Richmond Centre for Disability will accept registrations for the four remaining slots on a first come basis. For more information contact Rich Green by email or call 604-232-2404. Following the squad's third training camp, just concluded in Richmond BC, the players who will represent Canada at the 2010 Paralympics will be Jim Armstrong (skip), Darryl Neighbour (3rd), Ina Forrest (2nd), and Sonja Gaudet (lead) who are all from BC and were the on ice players during the final of the 2009 Worlds. The alternate is Bruno Yizek (Alberta). Read a profile of Bruno HERE. Should Ina or Sonja be unable to play before the team is officially registered in February, they would be replaced by Jackie Roy. It is unlikely, absent ill-health, that the alternate will see any playing time. Karen Blachford did not play in Torino. Followers of the comments on this blog will know that this was not a surprise selection. I have not spoken to any of the coaches about the reasons for their choices. The choice between Chris Sobkowicz, Gerry Austgarden and Bruno was undoubtedly a close one in terms of shooting ability, but in my opinion Chris had his opportunity at the last Worlds, and Bruno seems a better fit as an (unlikely to see playing time) 5th than the still very competitive and ambitious Torino 3rd, Gerry Austgarden. The Calgary Wheelchair Curling Association is gearing up for another great season of Wheelchair Curling and inviting all who are interested to come out and give it a try. 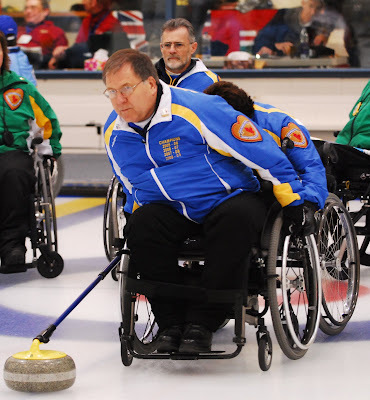 Since 2005, the Calgary Wheelchair Curling Association has grown to be the largest wheelchair curling league in Canada with over 30 members. 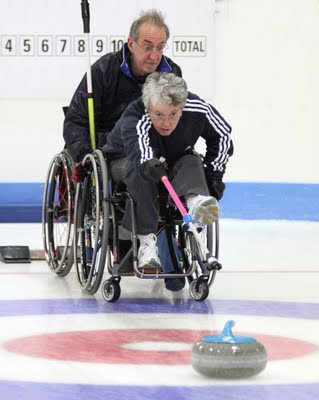 Many of the members are new to wheelchair curling and range from 9 to over 60 years of age, with varying forms of mobility or cognitive disabilities. The League starts October 3, 2009 from 10:30AM to 12:30PM at the Ogden Legion Curling Club 2625 - 78 Ave SE. Calgary and will run most Saturday mornings until March 2010. First time curlers are invited to attend free of charge. 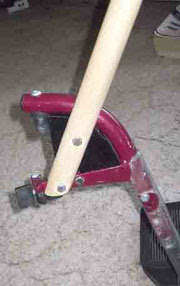 Curling sticks and equipment are provided so we just need the curlers. The Calgary Wheelchair Curling League is also looking for volunteers and sponsors this season as we expect to grow our membership. Renovations have now been completed at Jasper Place CC. The club raised $200,000 for the project, adding wheelchair accessible bathrooms and an elevator to the upstairs lounge, and will host the Alberta Wheelchair Curling Championships, February 5-7, 2010. The Edmonton Journal reports local curler Mike McMullan saying in the short time he has played, curling has already made a difference in his life. "It's enabled me to get out in the community even more. Your well-being is better if you're not cooped in a chair and sitting at home all the time. It's good socially and mentally, as far as I'm concerned." With the Jasper Place Curling Club hosting the upcoming championships, McMullan is pumped for what's to come. "It's good that Jasper Place is taking it this year, and we look forward to having it," adding that he looks forward to beating the Calgary teams, who have dominated the past few years. McMullan suggests would-be wheelchair curlers simply take the plunge --watch a game and then give the sport a try. Contact Cathy Craig, manager of Jasper Place, or call the club at 780.489.6428 for more information. "I had been away from curling, even social curling since 2006 after the Torino Olympics. When I was asked to coach the national wheelchair curling team I agreed because I thought my experience might help the team prepare for the Paralympics. "When I played with Peter Lindholm we approached the game seriously. We were an organized and well-prepared team. I hope that I can bring the approach that brought me success in regular curling, into the wheelchair game, both in organization and in understanding tactics. This team will have a game plan that suits the players, and we will play our game. "I think that wheelchair curling shares a great deal with regular curling, and though there will be more misses, hopefully throwing accuracy will improve (to help compensate for the lack of sweeping.) If I thought it was a completely different game I don't think I would have taken the job. "I have only just begun working with the team, and we have few opportunities for competition. I have been trying to find video to watch. There are not many wheelchair curlers in Sweden, and we don't play 4 on 4, even in our national championships because there are not enough players. "We played in Denmark and we will be going to Norway and Prague so we will see Canada play a couple of times before Vancouver. Canada are obviously big favourites for gold, but we will go hoping to win, or at least make the podium." Tomas agreed to another interview later this season, and it will be interesting to see whether or in what way his initial impressions change. Curious to know what's under the ice? 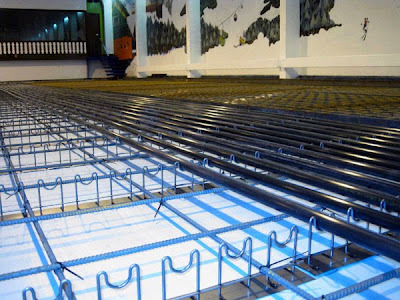 Bob Cowan, on his Skip Cottage Curling Blog, has some photos taken by Gail Munro of the replacement of the curling surface at the Stranraer (Scotland) Curling Club. The layers of ice that cover the painted rings on the concrete surface, are just part of what makes curling possible. CLICK HERE to see more. 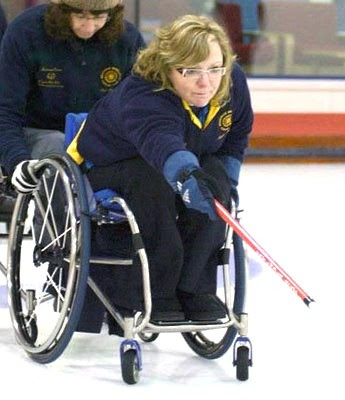 Opportunities for wheelchair curlers are growing in Nova Scotia, site of the 2009 National Championships. There is league play on Friday evenings at the Lakeside CC (contact Laughie Rutt) and starting this season there are plans for 2-on-2 play at the Halifax Curling Club on Sunday afternoons (contact Nancy Beaton). Laughie hopes to expand wheelchair curling to Windsor and Cape Breton, but wherever you live, new curlers are very welcome so make yourself known. I received the following note from Jim this morning, and am publishing it here as I know many people have had her in their thoughts since word broke about her illness. "It is with our deepest sorrow and regret that we inform you of Carleen's passing tonight. She fought a courageous battle against Cancer to the very end. We will miss her dearly. Arrangements will be decided shortly. We know your thoughts and prayers are with us." Carleen was a great supporter of wheelchair curling and made an appearance in this short documentary. British Curling have announced the cut from six to their five person Team Great Britain training squad. Angie Malone replaces Rosemary Lenton, the one change from the team that finished tied for 5th at the 2009 Worlds. Angie played lead on the Torino silver medal team, but had been fighting serious illness in recent years, and missed the 2008 and 2009 Worlds. The Great Britain squad (all Scots): Michael McCreadie, Tom Killin, Angie Malone (all Torino silver medallists) Aileen Neilson and Jim Sellar. This is a very experienced group who have all medalled at World level competition. Derek Brown, the British equivalent to the CCA's Gerry Peckham, said: "The athletes selected today know there is no room for complacency as selection for this squad does not in itself guarantee a place on the Paralympic Team." That selection will be announced at the end of the year. Tom Pendreigh, Head Wheelchair Curling Coach said "The GB squad will undertake an intensive training and competition schedule between now and the final selection date and I am looking forward to leading the squad in their final preparations for Vancouver." Just seven wheelchair users turned out for the Olson Curling Supply Ososyoos 2 on 2 spiel this weekend, and three of them were from out of province. The team of Darryl Neighbour and Chris Sobkowicz won, but it is a shame that having secured the support of a major curling sponsor, the organizers of the Osoyoos event have been unable to sustain the interest of even local Team Canada members. 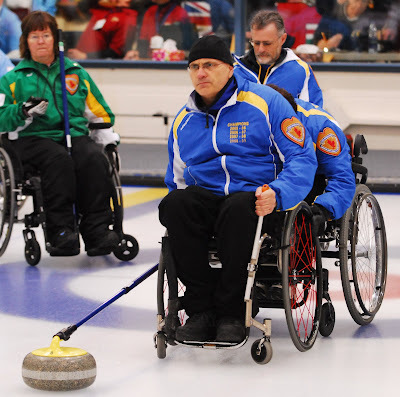 The poor attendance is a reflection of the parlous state of wheelchair curling in BC. Despite hosting the coach and four out of five of the national team, and taking the last three national titles, success at the top has not trickled down to inspire grassroots interest. In the past CurlBC has not seen it in their interest to encourage competitions outside of their immediate selection control. That appeared to change with last year's provincial playdown, but as things stand now, there is unlikely to be a 2010 playdown, for lack of female competitors. Russia went 4-0 to win the 12 team Danske Internationale Kørestole Curling Cup, the first event of a busy pre-Paralympic international calendar in Taarnby, Denmark. Germany placed second on points with a 3-1 record. Scotland and Sweden were also 3-1 while the Norway I team (they split their squad) were 1-3. Games were played over just 6 ends and full results are HERE. Russia did not qualify for the 2009 Worlds or the 2010 Paralympics, but are assured of a place as hosts of the 2014 Games. The next big international event is at the Halden Curling Centre in Norway, October 16-18. Canada's team for the 2010 Vancouver Paralympics will be announced on September 27th at the conclusion of the team's third training camp. Coach Wendy Morgan said that the team will be Jim Armstrong, Darryl Neighbour, Ina Forrest, Sonja Gaudet and one from the three men who have been attending the pre-season training camps: Bruno Yizek, Chris Sobkowicz and Gerry Austgarden. The five selected will travel to Norway and Scotland (see calendar). Jim Armstrong's fitness will be assessed during the camp. "If he is not fit to travel, we will just take four people," she said. "We are not anticipating that Jim will be unable to play in Vancouver, but the Paralympic registration deadline is not until February 25th so we have until then if we have to name a replacement." Canada has committed to having two women in the team, and BC's Jackie Roy has been training with the squad and would step in were Sonja or Ina unavailable. Canada has added a trip to Prague to their preparation schedule which means they will not be attending the Cathy Kerr Memorial Bonspiel in Ottawa. "We decided on Prague because Germany and Sweden and other top international teams will be competing there," Morgan said. "We are still considering several options for competitive play prior to the Paralympics, as well as hoping to get some practice on arena ice." The team will take up residence in the Paralympic Village on March 8, and the wheelchair curling event is scheduled from March 12-20. Team Canada skip Jim Armstrong has been involved in an accident that totalled his car. "My car rolled several times," he told me, "and I ended up on my injured shoulder and had to be cut out of the vehicle. I'm at home now and for some reason my shoulder seems to have survived the accident." A few days ago Jim was telling friends that he was going to rent an electric wheelchair so that he could get back out on the ice and rejoin his league team mates. It's not clear how the accident may affect his rotator cuff rehabilitation and availability for Paralympic selection. Of more immediate concern is the health of his wife who has been readmitted to hospital and is very seriously ill.
Gerry Peckham. the CCA's High Performance coach, said that while everyone was hoping that Jim would be available, contingency discussions have been taking place. Team Canada pool members had been expecting to know whether they had made the team by the end of the Richmond BC training camp the last weekend in September. "That decision may have to be delayed if Jim's status is unclear," said Peckham. "We have to decide whether we are looking for primarily a shot-maker, or someone who can help with strategy." Asked whether Chris Daw might rejoin the program, Peckham said that if that happened it would not be before 2010. "Chris has taken on a very challenging new job as manager of the curling club that will take over the Olympic curling facility after 2010. He will not be rejoining the team this season." Canada leave for spiels in Norway and Scotland in October (see calendar). The 3rd Annual Danske Internationale Kørestole Curling Cup 2009 began today at the Taarnby Curling Club. Denmark, Norway and Finland are each fielding two teams and teams from Scotland, Czech Republic, Germany, Sweden, Russia and Switzerland are also competing. The event is being organised by Per Christensen, a Dane who left his national team to take over from Thoralf Hognestad as coach of Norway. You can follow the event by clicking on the competition link of the Taarnby Club's website. The USOC has an excellent video profile of Team USA 2nd 'Jimmy Jam' Joseph on their TeamUSA.org website. In it he talks about how he became involved in wheelchair curling and how much it means to him to have the honour to play for his country. He's a double amputee and a high energy guy and a great ambassador for the sport. When Bob Cowan discontinued his Curling Today blog we lost a reliable source of stories and images of British curling. Happily he is back with a new blog, and I have already begun poaching his photos and will be referencing his reports over the season. I have re-activated the calendar page on wheelchaircurling.com. If you know of any events not listed, please let me know. Canada will have to avoid a slow start if they hope to medal at the 2010 Paralympics. They open against the only other semi-professional side, Great Britain (players are all Scots) and then take on USA and perennial nemesis Norway. The 10 team field appears to split 1-6-3 with Canada favourites given Jim Armstrong recovers from rotator cuff surgery. Six teams are in with a chance to challenge; Sweden, Germany, USA, Great Britain, Korea and Norway. Under-financed Italy, who faded from fatigue after a late arrival at the 2009 Worlds, inexperienced Japan who did not qualify in 2009, and a fortunate rebuilding Switzerland (silver in 2007) appear likely also-rans. CLICK HERE for full draw (pdf). Many, including Team Canada, were puzzled when the Scots changed their delivery zone from "as close to the hogline as possible" to the near ring t-line. Though throwing from further back increases delivery angles, especially on straight ice, it was a radical change that many outside observers felt was a significant factor in Scotland's fall from their pre-Torino dominance as the World's best team. Skip Michael McCreadie explained at the 2009 Worlds that the move had been fully discussed with the team and that everyone had bought into it. Coach Pendreigh appeared confident that given enough time, throwing closer to the hack would reap rewards in greater flexibility in shot making. It was noticeable, however, that some Scots were returning to the hogline when asked for up-weight hits. If nothing else, changing delivery positions complicated icing decisions for the skip. Today I asked Tom Pendreigh whether his team would continue the experiment as they began the competition year at this weekend's Danish Open. He characterised the change as "a skill learning project" that would continue to be available to the team. He made it clear, though, that delivery position was a decision for the player, taking into account ice condition. Here's his full statement: "The GB Squad embraced a skill learning project over 2 years ago which incorporated the ability to deliver stones from behind the T line. This is an option for any individual to consider whenever ice conditions are favourable, that has not stopped any player making the choice to deliver from anywhere between the T and the hog line as they see fit and we will continue with that theme." It will be interesting to see whether and under what circumstances, Scottish players continue with a t-line delivery. My guess is that this was an idea with a plausible justification, now being sold as a skill-learning exercise, that will be unlikely to reap reward on Vancouver Paralympic ice that's sure to have curl. Whether you are a curler, a coach or just a supporter of wheelchair curling, here are some tips to help you make the most of the coming season. Successful delivery of a rock depends on stable technique. You have to have balance, a repeatable stroke and full commitment to your motion. As my wife pointed out to me recently, it's more akin to a golf swing than a regular curling delivery. A couple of years ago I wrote an article discussing the importance of technique, and stand by what I wrote then. Today I would more strongly recommend an off-side hand brace. 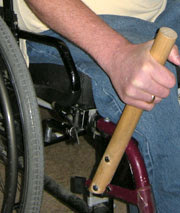 Almost everyone who begins their delivery motion sitting upright and square to the target would benefit [see images]. A brace allows you to commit your body weight forward while keeping your shoulders square, which should mean increased speed and greater accuracy. Where the brace is attached, and at what angle, will depend on your body shape and delivery motion. Bringing your non-throwing hand forward, rather than anchoring it behind your throwing hand, reduces your body's tendency to twist, and aids accuracy. A brace that allows you to commit weight forward without losing balance, adds power. We know that practice makes perfect, but that is true only if it is perfect practice. For example, if you need your chair to be held so that it does not move during delivery, then any solo practice, beyond perhaps weight control, may be counter-productive. You have to practice as you mean to play. Weight control is so difficult with such a short period of contact with the rock during delivery. If you spend almost all your playing time on the same ice, it will be especially difficult to adapt in competition to a different surface. One way to simulate fast or slow ice conditions is to vary your chair's location at practice. You are not limited by the hack, so there's no reason not move 3 yards forward to simulate faster ice. We all do some things just because we can, especially if they involve technology. Coaches are not immune, and shots are charted and graphs produced, and tendencies examined and it's all very clever until you have to come to the hogline cold, with the game on the line, and push that rock 40 yards based on just a second or two's contact with the stone. Practice statistics are always inflated by lack of pressure and the ability to throw multiple stones. Waiting 20 minutes between shots during competition is, I suspect, a major reason why open draws into the rings fail 40 percent or more of the time, even at the highest level. Don't let success at practice make you over ambitious in competition. Good shots, great shots, are not impossible, and they're the ones we tend to remember. Beyond the game-breaking miss we forget that misses predominate. Good game calling allows for a 50% game and reaps the benefit if the team throws 60%. Disaster looms the other way round. Finally we all have an interest in seeing our sport grow and we should ask ourselves what we can do as individuals to make that happen. I carry cards with local wheelchair curling information. Whenever I see a wheelchair user, I stop and ask if they have considered playing, and I give them a card. One of the current Team Canada members is playing today because our paths crossed at Costco, so it works! I have also been involved in drafting a brochure that will be going out to all the clubs, suggesting ways of introducing wheelchair curling. I'll put it online here later. 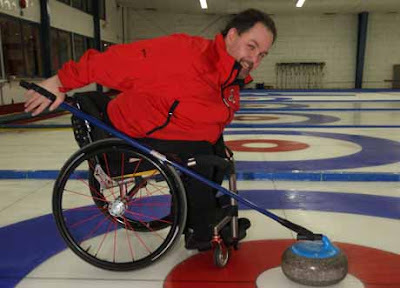 Successful programs have one thing in common - a person who believes that wheelchair curling should be played at their club, and is prepared to commit themselves to making that happen. Resources exist to help. We just need an advocate in every club. The hardest wheelchair curler to reach is the first one. Can you help? Friends of Team Canada skip Jim Armstrong have known for some time that his wife Carleen has been fighting cancer and is very seriously ill. I have considered this a private family matter and have chosen to make no more than passing reference to Carleen's plight. Today's Vancouver Sun carries a story by Al Cameron, describing in detail with numerous quotes from Jim, what the Armstrongs have been facing since Carleen's diagnosis. There is a legitimate interest in any issue that might affect Jim's availability for selection, though personally I am going to leave it at his assurance to me last week that he will be ready and able to participate come March 2010. I'm sure everyone reading this sends their best wishes to both Carleen and Jim as they face their medical challenges.